Freedom Planet is a love letter to the glory days of Sonic the Hedgehog. In fact, it started development as a Sonic fan game, until its developers at GalaxyTrail decided to create their own IP out of their love of the 16-bit Sonic the Hedgehog classics. The end results are a satisfying platformer that could even be called the best Sonic game of recent memory, even if it doesn’t boast the titular hedgehog. From the get-go, the Sonic influence is obvious. The game adopts the 16-bit visuals of the Sega Genesis, and no doubt its musical score echoes inspiration from Sega’s heyday (not just in Sonic, but a Nights Into Dreams influence can be heard from time to time as well). The base game includes two playable characters: Lilac is a suspiciously hedgehog-esque dragon who has powerful kicks and hair whips, as well as the ability to “dragon dash” using stored up energy, and a helicopter spin to add a little boost to her jumps. Carol is a wildcat who isn’t quite as strong as Lilac, but has quicker clawing attacks, can wall jump, leap between specially marked platforms, and can use the aforementioned energy for a rapid kicking combo. Post-release add-ons for the PC releases have added additional playable characters – including Milla the dog, the game’s tritagonist – though the Wii U version has yet to receive these updates. Either way, having two characters from the get-go gives players a little bit of diversity in its campaign, as Lilac and Carol battle armies of robots to save their planet from the evil Lord Brevon. 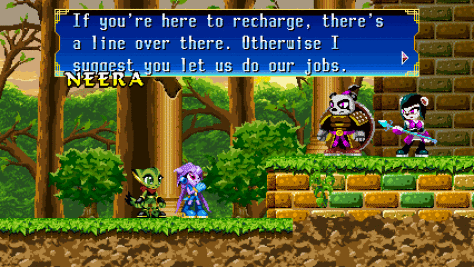 This simple story is perhaps the biggest differentiation between Freedom Planet and the 16-bit Sonics that inspired it. If you play the game in Adventure Mode, each level is introduced and concluded with a series of cinematics, complete with voice acting. I have to say, for having 16-bit limitations, the cinematics are actually quite impressive, though they can at times become a bit too lengthy, which is probably what inspired GalaxyTrail to also include Classic Mode, where players jump directly into the levels without all the cinematics. On one hand, I feel the game is definitely meant to be played with the story intact, and something feels a little off when playing it without them. But on the other hand, I’m not too big of a fan of some of the characters (like Milla, whose cuteness is forced to the point of obnoxiousness, or Torque, an alien ally who often wears a duck beak for some reason), whom I feel are a little on the pandering side, and again, some of the cinematics drag on and on. In the end, I suppose it’s all down to personal preference. The gameplay remains stellar, however, with clever level designs that contain multiple pathways a la 16-bit Sonic, with new mechanics added throughout the adventure to keep it all fresh. There are minor tweaks to the Sonic formula at play, however. Instead of rings that work as a health system and a means to gain extra lives, Lilac and Carol collect red leaves, with every two red leaves refilling one of their hit points. Meanwhile, blue crystals need to be gathered in quantities of 200 in order to gain an extra life. If there’s one big drawback to Freedom Planet, it’s that it boasts a rather glaring inconsistency in the difficulty between the levels and boss fights. The levels themselves can be easy or reasonably challenging, but even some of the game’s early bosses are on the frustratingly difficult side of things. It’s one thing if a hard game has hard bosses, or if the boss fights gradually become more difficult. But I can’t help but feel there’s no real transition in the boss difficulty. The levels themselves gradually stack up the difficulty, but the boss fights are difficult from the offset. The complaints are ultimately minor, however. 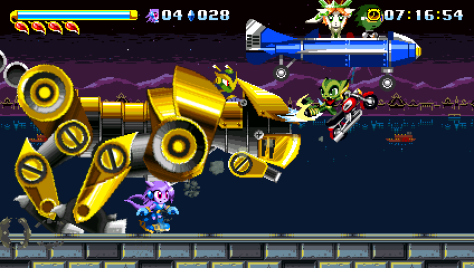 Freedom Planet itself is a whole lot of fun, and feels like a Genesis classic that never was. It’s lightning-fast platforming and smart level design stand favorably alongside Sonic’s most fondly-remembered adventures, it’s fluidly animated with surprisingly strong production values, and its soundtrack – like any great 16-bit title – is a thing of utterly infectious beauty. Sonic may have lost a step or two over the years, but Freedom Planet is a reminder that the foundations Sonic built were timeless and, of course, way passed cool. Looks interesting. The main characters kinda look like the characters from Sonic the Hedgehog!